I just went through my “BLOG Entries” list, which is comprised of Cozy Mystery readers’ questions and/or comments. I usually remember to delete the questions after I ask you all about them, but apparently, I don’t always remember to do that! Sher submitted a comment about a month ago asking us if we could come up with a book’s title. I wasn’t familiar with it, nor was anyone else who read her comment. Hopefully one of you will know the book she’s looking for! I’m sorry, Sher, but I don’t even know what “longarm quilting” is! Hopefully, another Cozy Mystery reader will know the author or the book’s title. If you think you know the title of the book or its title, please post a comment. Thanks! I googled this and they showed on old cozy mystery site. A lady on there had same question and another told her it may be Harriet Truman/Loose Threads series by Arlene Sachitano. Maybe this will help and if this isn’t the one she is looking for there were a lot more suggestions there. Good Luck. Jane C, I didn’t even think to google “longarm” quilting Cozy! Great idea. And, thanks for telling us about Arlene Sachitano. Danna, please have Sher check under your Guideposts listings, then under their Patchwork Mysteries sub-listing. The sleuth is a quilter and I read one or two in the series and there were secret rooms involved. You show 27 in the series and it was #1 and #2 that I read. This was in the time frame Sher mentioned. Each book has the same characters but different authors. I received mine in a contest to introduce me to the various Guideposts book clubs. That was the only way to get that series but I see that they are on Amazon as used. They are great reads with a Christian background. Doward W, thanks! I’ll be sure to tell Sher to take a look at Guideposts’ Patchwork Mystery Series. I believe that’s Arlene Sachitano’s Loose Threads Mysteries, which I found highly enjoyable. Oops, forgot the title: Quilt as Desired. There are 8 books in this series. 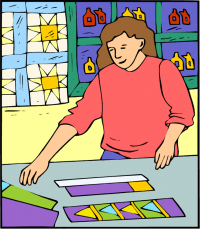 there is another with a longarm quilter now, the woman took over for her Aunt who retired gave her the house, the business and the quilting group. I just read one and cannot think of the name good series. Is there going to be a book 10 in the loose thread mystery series by Arlene Sachitano?